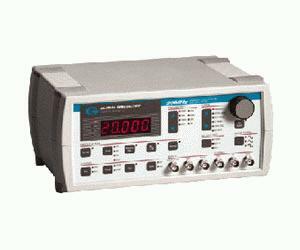 The Global Specialties new "Pure Wave" line of function generators offers superior accuracy & flexibility, designed to meet the most demanding test & measurement applications. Four models are available in 2MHz, 5MHz, 10MHz, & 20MHz maximum frequency ranges. Microprocessor controls deliver a purely stable and accurate output with frequency stability of 0.1% and total harmonic distortion less than 1%. Each unit comes with a standard RS-232 interface, as well as a 40MHz external frequency counter. Made with the unwavering commitment to high quality and craftsmanship you have come to expect from Global Specialities, along with an industry-best 3-year warranty behind it.